Lena DeGloma's experience as a certified birth doula, certified lactation counselor, licensed massage therapist, and clinical herbalist informs her approach to holistic childbirth education. 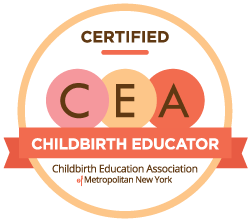 She is a Certified Cooperative Childbirth Educator (CCCE) through the Childbirth Education Associtation of Metropolitan NY (CEA/MNY) where she currently serves as a member of the Board of Directors and teaches to childbirth-educators-in-training in the CEA/MNY teacher certification program. You will be learning from someone with both clinical and teaching experience in holistic health fields (massage therapy, herbal medicine and nutrition) as well as a decade of experience attending births at homes, birthing centers and hospitals throughout NYC. This 2-day weekend intensive is one of the most comprehensive Childbirth Education classes in the city and includes the most up-to-date, evidence-based information to fully prepare you for the birthing process in all settings. This class is designed to be taken together with the Holistic Newborn Care & Breastfeeding Workshop which takes place the following Sunday afternoon and you save $80 when you register for both together (see details below). Natural, non-pharmacological ways to manage common issues in pregnancy and childbirth including herbs, nutrition, self-massage, etc. The classes are a blend of lecture, demonstration, hands-on practice, video clips, discussion and Q&A. It is a lively, evidence-based, and information-rich course. *If you’d like to register for both, after clicking the “register now” link, scroll to the childbirth education date you would like to register for and then choose the "Childbirth Ed & Holistic Newborn Care" pricing option to receive your $80 discount (this will automatically register you for both the childbirth ed weekend intensive and the holistic newborn care and breastfeeding workshop the following Sunday). This Holistic Newborn Care & Breastfeeding Workshop is designed to be taken together with the Holistic Childbirth Education Weekend Intensive which takes place the weekend prior, but can be taken as a stand-alone workshop. If you’d like to register for both together there is an $80 discount - see above for more information. The class is a blend of lecture, demonstration, hands-on practice, video clips, discussion and Q&A. It is a lively, evidence-based, and information-rich course. *If you’d like to register for both, after clicking the “register now” link, scroll to the *childbirth education* date you would like to register for and then choose the "Childbirth Ed & Holistic Newborn Care" pricing option to receive your $80 discount (this will automatically register you for both the childbirth ed weekend intensive and the holistic newborn care and breastfeeding workshop the following Sunday). This course was amazing! Lena is so knowledgeable and so gifted at imparting that knowledge. I had no idea what to expect, and had doubts about spending $400 on a course. Coming away, I feel the course was the bargain of the century, and that I can't believe we might have gone into childbirth and new parent-hood not having had this training. I've been reading for 8 months, but I got more out of these 3 days of class than I got out of all of my independent reading. The course was thorough and informative. Information was rich, evidence-based, current, and applicable to all birth settings. I would definitely recommend this course to other expectant couples because I believe it provides great preparation for birth and it's paced so that the information can be absorbed. I also liked the videos & handouts provided online - great supplements to what was covered in session. I am so excited for my friends to get pregnant so that I can recommend your classes to them! I think we have clearer expectations and feel more confident expressing our wishes to our providers and our family now that we have taken this class series. We also are able to actually articulate our labor and birth preferences now, based on Lena's suggestions. This class empowered me to try a drug-free birth. We went from a general state of fear of unknown around labor and the immeasurable pain that we had heard about, to feeling that we understand the process well, the things to be worried about, the things not to be worried about, and we're prepared to work through the pain. And none of it feels truly scary any more. This is PHENOMENAL - neither of us expected to get to that place before the actually going through it ourselves. Lena offers private or semi-private classes for up to 3 expectant families. Private classes generally take place at your home (in Brooklyn or lower Manhattan). Private classes are $140 per hour (semi-privates are $150 per hour divided by two couples or $165 per hour divided by 3 couples) and a minimum of 3 hours per session. Private classes for 6 hours or longer can be scheduled to take place in multiple sessions over a number of weeks or as an intensive in a day or two. If you have any questions or would like to schedule a private or semi-private session, please email office@redmoonwellness.com. I do not believe in any one "method" as the answer to coping with childbirth. Instead, I teach a variety of coping techniques and emphasize supporting the natural physiological process of birth by listening to your body and coping based on your body’s needs in the moment (as opposed to a predetermined method that you are supposed to learn and practice). The foundation of my philosophy around childbirth is based in the conviction that birth is a normal, healthy, and safe physiological process that—while extraordinarily challenging—has the potential to lead to great personal satisfaction and a feeling of empowerment and accomplishment which can set the stage for a smooth transition into confident and loving parenting. I also recognize that there is an enormous diversity of birth experiences and many aspects of that experience are not in anyone's control - I honor and acknowledge that your individuals choices around your birth are what is best for you given your particular circumstances even if those are choices you had hoped not to make. There is no right or wrong way to give birth, only the way that is best for you - and I know you can make the best decisions for yourself when you have complete and accurate information. My intention is for you to leave the class with a sense of readiness and trust in your body’s ability to give birth and a greater set of resources and community to rely on for support in your transition to parenthood.